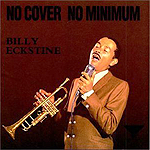 CD review: "No Cover No Minimum"
This collection of Roulette Records sides from 1960 showcases Billy Eckstine in his finest setting  fronting his own band in a nightclub performing some of the century's best songs. Possessed of the finest male voice in jazz history, Eckstine matched his velvet throat with unquestionable taste and suave sophistication. As jazz historian Will Friedwald points out in the liner notes, only Frank Sinatra and Nat "King" Cole could equal Eckstine's adult sensuality as singers. If the band backing Eckstine on this date is relatively unknown, the material is classic. "I've Grown Accustomed To Her Face," "Lush Life," "It Might As Well Be Spring" and "Misty" are just some of the highlights from the 14 tracks on this release. A special  and rare  treat is several songs where Eckstine plays a muted trumpet. Underrated as a horn player, Eckstine didn't often record on the instrument. But here he shows the same taste, restraint and maturity on horn as does as a singer.